The big story of the day is San Diego's decision to retain head coach Norv Turner and general manager A.J. Smith for the 2012 season. My Twitter feed exploded with the news around 1:30 p.m. CST today with mostly negative thoughts about the decision. As always, time will tell if this was a smart move by Chargers owner Alex Spanos, or if this decision is connected with a possible return to Los Angeles by the Chargers. It's easier to move a struggling team that it is to relocate a winner. Note: before I had the chance to publish this column, Jim Trotter of SI wrote on Twitter that there is no connection between the decision to retain Turner/Smith and the possibility of the Chargers moving back to Los Angeles. Apparently I wasn't the only one who thought there might be a connection there. But Trotter also noted that Spanos hasn't committed to keeping the Chargers in San Diego long-term. Several players have announced their plans over the past few days to leave school early and declare for the 2012 NFL Draft. Here's a look at the status of many of the highest touted non-senior draft-eligible NFL prospects, listed by position. To be draft eligible, a player must be three years removed from his high school class graduation. For example, a redshirt sophomore like Lamar Miller can go pro, but a true sophomore like Marcus Lattimore can't. Keep in mind that, unless a player has signed with an agent, he can potentially change his mind and go back to school. Eligible underclassmen have until January 15 to apply for early entry into the 2012 NFL Draft. Andrew Luck, Stanford (rJr): Going pro. It's silly that NFL personnel haven't been able to openly comment about him, but that's a small price to pay for having a free farm system run by the NCAA. Robert Griffin III, Baylor (rJr): Going pro. Baylor put Griffin back in their 2011 game against Texas Tech after he had been knocked unconscious earlier. This was inexcusable given what researchers have learned about the severe, long-term impact of concussions, particularly the impact of multiple severe concussions. I have been disappointed by the overall lack of outrage at Baylor over what happened; it deserves no less attention than what the Browns have received in recklessly playing a concussed Colt McCoy against Pittsburgh last month. Mark Barkley, USC (Jr): Returning for 2012. He announced his plans to stay in an over-the-top ceremony that aired live on ESPN last month which included the playing of the USC fight song, a Christmas tree backdrop, and comments from an elated Lane Kiffin. Landry Jones, Oklahoma (rJr): Undeclared. Trent Richardson, Alabama (Jr): Going pro. A former five-star prospect out of high school, Richardson has lived up to the hype in Tuscaloosa and proved this past season that he can be a successful primary running back. Lamar Miller, Miami (rSo): Going pro. He very well might end up being the second running back selected in the 2012 NFL Draft. Knile Davis, Arkansas (rSo): Undeclared. Didn't play for Arkansas in 2011 after suffering a broken left ankle in a pre-season scrimmage. Was a dominant force for the Razorbacks in 2010. Montee Bell, Wisconsin (Jr): Undeclared. Claims he will announce his plans for 2012 soon. LaMichael James, Oregon (rJr): Going pro. He has the skill to make an immediate impact in the NFL. Chris Polk, Washington (rJr): Going pro. 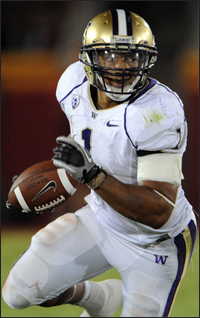 In many ways Polk is an unknown commodity to much of the country due to playing for a mediocre UW team, though he gained plenty of attention with his 30 carry, 147 yard rushing performance in the 2011 Alamo Bowl. Robert Turbin, Utah State (rJr): Going pro. Great player who isn't as well-known as others on this list but who has great potential. David Wilson, Virginia Tech (Jr): Undeclared, but likely to announce his decision soon after tonight's Orange Bowl game. Bernard Pierce, Temple (Jr): Undeclared. Andre Ellington, Clemson (rJr): Undeclared. Bryce Brown, Kansas State (rSo): Going pro. The biggest running back wild card prospect in this draft, Brown has exceptional talent but barely played for the Wildcats in 2011 before abruptly leaving the team mid-season. Brown could end up lost in the shuffle with so many strong senior RB prospects vying for spots and almost all of the elite draft-eligible running backs deciding to head to the NFL. Justin Blackmon, Oklahoma State (rJr): Going pro. At this point Blackmon is the top NFL wide receiver prospect for 2012. Alshon Jeffery, South Carolina (Jr): Undeclared. Faces possible sanctions from South Carolina if he returns due to his involvement in a fight with Nebraska CB Alfonzo Dennard in the Capitol One Bowl that ended with both players ejected from the game. Mohamed Sanu, Rutgers (Jr): Going pro. Had a huge 2011 season and lived up to the expectations that many had for him. Rueben Randle, LSU (Jr): Undeclared. Tarvarres King, Georgia (rJr): Undeclared. Chris Givens, Wake Forest (rJr): Going pro. I saw him play in person in the Music City Bowl, where he made nine receptions for 54 yards. Strong possession receiver prospect. Tommy Streeter, Miami (rJr): Going pro. Perhaps the most intriguing early entry WR candidate; is he a one-year wonder or a breakout star ready to make a major impact in the NFL? Cobi Hamilton, Arkansas (Jr): Undeclared. Dwayne Allen, Clemson (rJr): Undeclared. Orson Charles, Georgia (Jr): Undeclared. He's especially skilled as receiving, something that should help his NFL stock either this year or next. Tyler Eifert, Notre Dame (rSo): Undeclared. Was named to the Walter Camp first team and All-American second team lists for 2011. Philip Lutzenkirchen, Auburn (Jr): Undeclared. Joseph Fauria, UCLA (rJr): Undeclared. A transfer from Notre Dame, Fauria showed glimpses of explosiveness in 2011. Matt Kalil, USC (rJr): Going pro. Kalil is the top offensive line prospect and might be drafted as high as #2 overall by St. Louis in the 2012 NFL Draft. Jonathan Martin, Stanford (rJr): Going pro. He will likely be the second offensive lineman drafted in April, possibly going in the top ten of the draft. Riley Reiff, Iowa (rJr): Undeclared. Could push Martin for the #2 offensive tackle slot on some draft boards. Alex Hurst, LSU (rJr): Undeclared. Was named to the All-SEC football first team last month. Justin Pugh, Syracuse (Jr): Undeclared. David DeCastro, Stanford (rJr): Going pro. Some speculate he could be a top ten pick, and while I think that's too high of a projection, he is a likely first round pick and is poised to battle Georgia senior OG Cordy Glenn for the top offensive guard spot in the 2012 NFL Draft. Barrett Jones, Alabama (rJr): Returning for 2012. If that stands, he'd possibly be the top offensive guard NFL prospect going into the 2012 college season. Brandon Washington, Miami (Jr): Going pro. A tweener prospect who played tackle for the Hurricanes but who perhaps best projects as a guard in the NFL. Chance Warmack, Alabama (Jr): Undeclared. Yes, Alabama has two of the top 4-5 draft-eligible non-senior offensive guards. Nick Saban is a masterful recruiter. Larry Warford, Kentucky (Jr): Undeclared. He has fantastic pass rush skills. Peter Konz, Wisconsin (rJr): Undeclared. Konz has filed paperwork to determine his draft status, though it's not particularly common for centers to leave early for the NFL. He was having a great season until dislocating his left ankle in November against Minnesota. Khaled Holmes, USC (rJr): Undeclared. Jerel Worthy, Michigan State (rJr): Undeclared. Worthy was a key part of a 2011 Spartans defense that was fantastic at stopping opposing running attacks. Fletcher Cox, Mississippi State (Jr): Going pro. He reportedly received a second round grade from the NFL Draft Advisory Committee, but I believe he could end up as a first round selection. Star Lotulelei, Utah (Jr): Returning for 2012. Lotulelei received the defensive Morris Trophy for 2011, an award given to the Pac-12's most effective offensive and defensive lineman. Kawann Short, Purdue (Jr): Undeclared. Recorded 6� sacks and 17 tackles for loss in 2011 for Purdue. Dontari Poe, Memphis (rJr): Going pro. Probably the best 3-4 defense nose tackle prospect in the upcoming draft. Marcus Forston, Miami (rJr): Going pro. Injuries limited his production this past season for the Hurricanes. Jordan Hill, Penn State (Jr): Undeclared, but has said he expects to return to Penn State unless the NFL Draft Advisory Committee gave him a first-or-second round grade. Sylvester Williams, North Carolina (Jr): Undeclared. Juco transfer who has only played one season for the Tar Heels. Jesse Williams, Alabama (Jr): Undeclared. Likely to return to Alabama after joining the program about a year ago as a junior college transfer. Nick Perry, USC (rJr): Going pro. A likely first round pick in April's draft. Brandon Jenkins, Florida (Jr): Undeclared. Could end up as a defensive end or an outside linebacker at the next level depending on which teams drafts him, be it in 2012 or 2013. Devin Taylor, South Carolina (rJr): Undeclared. John Simon, Ohio State (Jr): Undeclared. All-Big Ten first teamer in 2011. Whitney Mercilus, Illinois (rJr): Going pro. Ron Zook didn't find long-term success at Illinois, but he managed to recruit some great players there. Mercilus recorded 16 sacks in 2011, tops in the NCAA, and he was a first team All-American. Mercilus also forced 9 fumbles this past season. It's entirely possible that Mercilus will crack the first round mock here on Draft King when I redo it again after this weekend's NFL playoff action. Chandler Jones, Syracuse (rJr): Going pro. Likely day two selection in April. Dion Jordan, Oregon (rJr): Undeclared. Converted tight end who could use another year of experience on defense. Ronnell Lewis, Oklahoma (Jr): Undeclared. Looks like a probable jump to the NFL, as despite having recovered an ankle injury, he was kept out of the Insight Bowl by Oklahoma for because for academic reasons. Sean Porter, Texas A&M (Jr): Undeclared. Helped fill the huge void left by Von Miller's departure by recording 8� sacks and 16 tackles for loss this past season in A&M's 3-4 defensive set. Nico Johnson, Alabama (Jr): Undeclared. Was a five-star recruit coming out of high school, though he didn't post huge numbers this year. Johnson is excellent against the run and would be a good fit for a 3-4 defense looking to boost its rushing defense. Chase Thomas, Stanford (rJr): Undeclared. Had an excellent season for the Cardinal and could possibly decide to jump to the NFL. His huge production early in the season dropped somewhat when fellow LB Shane Skov was lost for the year to injury. Jonathan Massaquoi, Troy (rJr): Undeclared. Might be too small to be effective as a 4-3 DE and projects best as an OLB. Gerald Hodges, Penn State (Jr): Returning for 2012. Luke Kuechly, Boston College (Jr): Undeclared. Was a tackling machine and a bright spot on an otherwise moribund Boston College team. Vontaze Burfict, Arizona State (Jr): Going pro. Has incredible potential and great talent, particularly at blitzing and in making open-field tackles. With some maturing and with the right team, he could become a superstar in the NFL. Manti Te'o, Notre Dame (Jr): Returning for 2012. Dont'a Hightower, Alabama (rJr): Undeclared. Underrated talent among a skilled group of inside linebackers with NCAA eligibility for the 2012 season. Morris Claiborne, LSU (Jr): Undeclared. Likely top 5-10 pick in the 2012 NFL Draft if he leaves school after the BCS Championship Game. Dre Kirkpatrick, Alabama (Jr): Undeclared. Fantastic talent who is likely to be drafted ahead of everyone else not named Morris Claiborne in the 2012 Draft if he leaves Alabama after the season. Jonathan Banks, Mississippi State (Jr): Returning for 2012. Major coup for Mississippi State to get Banks back for his senior year. He had a memorable game in 2009 as a true freshman against Florida, recording an impressive two pick-sixes on Tim Tebow. Stephon Gilmore, South Carolina (Jr): Undeclared. Jayron Hosley, Virginia Tech (Jr): Going pro. His stats dropped from his nine interception 2010 season this past year, but he is a talented corner. Cliff Harris, Oregon Going pro. Was dismissed from Oregon in 2011, a stunning turn of events for the 2010 All American who at one point looked like a potential first round pick before running into some off-the-field problems. Bacarri Rambo, Georgia (rJr): Undeclared. Was a first-team All-American in 2011, but claims he received a third-round projection from the NFL Draft Advisory Committee. Robert Lester, Alabama (Jr): Undeclared. After an eight interception 2010 season, Lester made only two picks in 2011, though he will have a chance to add to that total in the BCS Championship Game against LSU. T.J. McDonald, USC (Jr): Returning for 2012. Is the son of former San Francisco 49er Tim McDonald and one of the best players returning for the Trojans defense for this fall. John Boyett, Oregon (rJr): Undeclared. Ray Ray Armstrong, Miami (Jr): Returning for 2012. It's somewhat surprising that he will be going back to Miami after missing multiple games in 2011 due to NCAA-mandated rule violations. Typically, once an elite player has faced sanctions from the NCAA, they head to the NFL as quickly as possible. Orhian Johnson, Ohio State (Jr): Undeclared. Kenny Vaccaro, Texas (Jr): Returning for 2012. Mack Brown doesn't have the magic touch to keep guys through their senior year that he once did, but the Longhorn defense will get Vaccaro for 2012. DeVonte Holloman, South Carolina (Jr): Undeclared. Has reportedly submitted paperwork to the NFL Draft Advisory Committee, but no word yet on what his projected grade is. Prentiss Waggner, Tennessee (rJr): Undeclared. Would be a surprise for him to leave early for the NFL. No kickers or punters are listed on here, for obvious reasons.